To date, no evidence-based guidelines for the treatment of chronic osteomyelitis exist. Owing to certain similarities, treatment philosophies applicable to musculoskeletal tumour surgery may be applied in the management of chronic osteomyelitis. This novel approach not only reinforces certain important treatment principles, but may also allow for improved patient selection as surgical margins may be customised according to relevant host factors. When distilled to its most elementary level, management is based on a choice between either a palliative or curative approach. Unfortunately there are currently no objective criteria to guide selection of the most appropriate treatment pathway. The pre-operative diagnostic work-up should be tailored according to the relevant objective, albeit confirming the clinical suspicion of the presence of infection, host stratification, anatomical disease classification, pre-operative planning or post-operative follow-up. MRI and PET-CT are emerging as the imaging modalities of choice. interleukin-6, in combination with CRP, has been shown to have excellent sensitivity in the diagnosis of implant-associated infection. Molecular methods are growing rapidly as the method of choice in pathogen detection. Chronic osteomyelitis, as is the case with musculoskeletal tumours, can only be eradicated through complete resection of all infected bone. Chemotherapy, in the form of antibiotics, only plays an adjuvant role. Dead space management is essential following debridement, and the appropriate strategy should be selected according to the anatomical nature of the disease. Provision of adequate bony stability is crucial as it promotes revascularisation and maximisation of the host's immune response. Although there is currently a variety of fixation options available, external fixation is generally preferred. The poor outcome of treatment in chronic bone infections has inspired many changes in our management strategy over the past few decades. The 1970s can be seen as the era of secondary healing. During this period sequential debridement, healing by secondary intention and long-term antibiotic treatment were the order of the day. Reconstruction options were often limited to open sky techniques (Papineau grafting) or bypass grafting. As a result of these limitations the extent of surgical debridement was restricted and residual fibrotic and ischaemic tissue was often left behind, impairing the host's ability to launch an effective defence against bacterial persistence. In the 1980s wound revitalisation, involving thorough wound debridement with excision of all ischaemic tissue, became the mainstay of treatment. In conjunction with systemic and local antibiotic therapy, wound revitalisation allowed early closure of wounds following the debridement.3 The era of revascularisation followed as a result of this new-found ability. In the 1990s free tissue transfer involving microvas-cular anastomosis became an integral part of the post-infective reconstruction process. The advances in soft tissue management culminated in the creation of a wound bed that was able to withstand the metabolic demands of more complex limb reconstruction procedures. In the past two decades, the potential for skeletal reconstruction has reached new heights. Salvage protocols for peri-prosthetic infection, incorporating staged endo-prosthetic replacement, have grown in popularity. The propagation of the science of distraction osteogenesis and Ilizarov techniques outside of Russia has allowed surgeons the opportunity to reconstruct much larger bone defects than before. Most recently the induced membrane technique, popularised by Masquelet, has emerged as a useful adjunct in the management of large bone defects following debridement. In Part I of this two-part series we will discuss the management strategies currently available for the management of chronic osteomyelitis. Certain novel concepts, key to the decision-making process, will also be introduced. The different diagnostic modalities, which may be employed in the conformation of the presence of infection or during the pre-operative workup of the patient, will also be explored. Finally we will discuss the surgical management strategies that may be implemented during the first stage of treatment, with specific reference to debridement techniques, pathogen detection, dead space management and skeletal stabilisation. In Part II of this series on the management of chronic osteomyelitis, which will be published in the next issue of this journal, we will review antibiotic therapy, as well as soft tissue and skeletal reconstruction following debridement. To date, no evidence-based guidelines exist in terms of the treatment of chronic osteomyelitis.4 When distilled to its most elementary level, management is based on a choice between either a palliative or curative approach. Management strategies, aimed at eradication of infection and limb reconstruction, incorporate a wide array of surgical procedures and techniques in terms of debridement, dead space management, soft tissue cover and skeletal reconstruction. While curative management strategies usually involve multiple surgical procedures, palliative treatment strategies, on the other hand, are much less invasive and typically involve the use of chronic suppressive antibiotic therapy. Thus the most important decision a surgeon faces is whether to embark on either a curative or a palliative treatment strategy. This decision regarding cure or palliation requires consideration of several factors, foremost of which is the host's physiological status. As described by Cierny, a C-host should be palliated, whereas A- and B-hosts may be considered for a curative treatment protocol. The main risk involved in certain curative treatment strategies, is the fact that treatment failure may result in unplanned amputation of the limb. If, for example, wide resection and limb reconstruction through bone transport is embarked upon in a patient who is unable to cope with the physical or physiological demands of the process, failure of the reconstruction process may result in amputation. To justify the morbidity and risk of limb salvage, the expected outcome must offer distinct advantages over an amputation or palliation alone. If treatment aimed at cure is contraindicated or excessive, as a result of the risk it entails, the patient should be classified as a C-host and offered palliation (incision and drainage, oral antibiotics, ambulatory aides, and pain medication). Amputation may be indicated when limb salvage and palliation are neither safe nor feasible.5 The main problem we currently face, however, is the absence of objective criteria according to which a C-host should be defined. 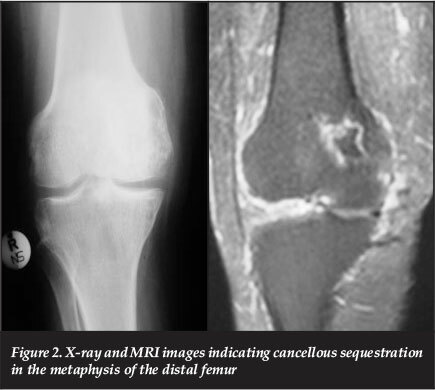 Owing to various similarities, principle among which is the high recurrence rate following incomplete excision, certain treatment philosophies applicable to musculoskeletal tumour surgery may also be applied when formulating a treatment plan for chronic osteomyelitis. Excision margins, for example, may be thought of in oncological terms with a simple sequestrectomy representing an intralesional excision, direct or indirect unroofing a marginal excision, and finally a complete resection can be seen as a wide excision. Similarly antibiotic therapy can be thought of as chemotherapy which may be instituted in a neo-adjuvant, adjuvant and palliative setting. This novel approach to chronic osteomyelitis not only reinforces certain important treatment principles, but may also allow for improved patient selection as surgical margins may be customised according to relevant host factors. Patient evaluation should include a meticulous history taking and careful examination. Information should be gathered regarding the main complaint, associated problems, medical history, previous surgical history and prior therapeutic interventions. Examination should include a systemic evaluation as well as a thorough assessment of the local pathology, skeletal stability, the condition of the soft tissues, vascularity and neurological status. Imaging modalities should be tailored to the relevant objective, albeit confirming the clinical suspicion of the presence of infection, anatomical disease classification, pre-operative planning or post-operative follow-up. Ultrasonic waves do not cross cortical bone but ultrasound is still useful in the assessment of the presence of periosteal reaction or purulent collections. Ultrasound may also be utilised as a guide during deep aspiration of fluid collections for culture and sensitivity. X-rays and CT scanning are useful in localising sequestra or cloacae and also aid in the assessment of skeletal integrity and stability (Figure 1). MRI has evolved as the modality of choice, especially in light of the modern oncologically oriented approach. It provides the most accurate information on extent of disease in bone and soft tissue and is therefore especially useful when planning a marginal or wide resection6(Figure 2). As is the case with imaging modalities, laboratory investigations may be used in several contexts. In all patients a comprehensive haematological and biochemical profile, including a full blood count, renal and liver function tests, as well as an electrolyte and nutritional profile is required in order to stratify the host's physiological status. In addition, supplementary tests may be required to ascertain the degree of systemic compromise as a result of certain specific disorders. Examples include HbA1C assessment in the case of diabetes mellitus, creatinine clearance in patients with chronic renal failure, and CD4 counts and viral loads in HIV-infected individuals. On the other hand tumour necrosis factor and interleukin-8 have been shown to be elevated in acute, but not in chronic post-traumatic osteomyelitis.14 These pro-inflammatory cytokines have unfortunately not been studied in the setting of chronic haematogenous osteomyelitis. Following the confirmation of the presence of infection and determination of the severity of the disease, attention should shift towards accurate anatomical and physiological classification. Numerous classification systems have been described. The Cierny and Mader system remains the most popular classification system in use today. The most important decision is to embark on either a curative or palliative treatment strategy. Once a curative management option is selected emphasis should be placed on host optimisation, and modifiable risk factors should be addressed. Reversal of these risk factors will improve the outcomes in B-hosts to more closely resemble the results seen in A-hosts.15 Cessation of smoking, tight glycaemic control and dietary supplementation, for example, take precedence over any surgical intervention. Cierny has previously recommended that attempts be made to identify the pathogen prior to the first formal surgical debridement through biopsy of deep granulation tissue.16 This view is not uniformly held and not routinely implemented. In cases without significant local or systemic septic complications, pathogen detection may be delayed to after the primary debridement procedure. In certain scenarios pre-operative ('neo-adjuvant') antibiotics may be mandatory, for example in patients with significant local (cellulitis in the region of the incision) or systemic compromise (systemic sepsis or septic shock). In such cases pre-operative identification of the causative organism is essential and samples for microscopy, culture and sensitivity (MCS) should be obtained either through open biopsy or deep aspiration under ultrasound guidance, prior to definitive surgery. In cases without significant local or systemic septic complications, pathogen detection may be delayed to after the primary debridement procedure. Schmidt et al. illustrated that osteitis can only truly be eradicated through complete resection of all infected bone, and that remaining infected or devitalised bone segments may act as a source for persistent infection or result in late reactivation. On the other hand, the authors pointed out that affected bone may recover when it is surrounded by vital, healthy soft tissue.21 When contemplating the extent of the debridement the anatomic nature of the disease, the physiological condition of the host and the proposed skeletal reconstruction technique should be considered. Compromised hosts, for example, are theoretically best treated with a wide resection of all infected tissues and subsequent limb recon-struction.22 But herein resides one of the main problems a surgeon faces when dealing with a compromised host. Wide resection and limb reconstruction is advised to achieve cure, but the reconstruction procedures required, typically involving bone transport or extensive bone grafts, are fraught with danger in the poor host and failure frequently results in the amputation of the limb. Routine microscopy, culture and sensitivity (MCS) of tissue, bone and exudates taken under aseptic condition in the absence of antibiotic therapy in the preceding ten days, still serves as the primary diagnostic modality in order to confirm the presence of infection.23 Multiple samples should be acquired early in the procedure from fluid collections, soft tissue, bone and foreign materials or sequestra. Samples should undergo aerobic and anaerobic incubation for prolonged periods, at least seven days, in order to increase detection of fastidious organisms. Owing to the fact that only a minor fraction of biofilm-based micro-organisms is planktonic in nature (and thus available for culture) and small colony variants may enter a latent metabolic state, traditional culture techniques are frequently unreliable in the identification of the causative pathogen embedded in the biofilm covering implants or necrotic bone. Culture yield from implants or sequestra can be enhanced through sonication, a process utilising ultrasound to shear organisms from the biofilm on the substrate.24 This technique may be especially valuable in low-grade periprosthetic infections. Several alternatives are available to deal with the dead space resulting from the excision of necrotic and devitalised tissue. Contemporary techniques include gentamycin-impregnated polymethylmethacrylate (PMMA) beads, Lautenbach irrigation systems, physician-directed antibiotic-impregnated PMMA spacers or intra-medullary nails, as well as antibiotic-loaded calcium sulphate pellets. All of these methods incorporate local adjuvant antibiotics, aimed at eradicating persistent bacterial contamination. The choice of dead space management is generally determined by the patho-anatomical nature of the disease and the volume of the dead space. Continuous irrigation, as popularised by Lautenbach, remains a versatile dead space management technique and is commonly utilised in Cierny and Mader type I post-operative infections.25,26 Alternatively, antibiotic-impregnated PMMA intramedullary nails may be used in type I infections, especially in the setting of post-operative sepsis.27 Dead space following debridement of type II lesions are typically dealt with through local or free soft tissue transfer procedures. Gentamycin-impreg-nated PMMA beads remain useful in type III lesions despite the fact that they require removal at a subsequent procedure. This disadvantage has prompted the use of several alternative, absorbable products including antibiotic-impregnated lyophilised collagen sponge, calcium sulphate pellets and bioactive glass.28,29 Concerns have, however, been raised regarding the occurrence of aseptic wound dehiscence with the use of calcium sulphate pellets.30 Antibiotic-impregnated PMMA spacers, commonly utilised in the setting of peri-prosthetic infection, have gained much popularity in the management of other Cierny and Mader anatomical type IV infections following the encouraging results with the induced-membrane technique reported by Masquelet31(Figure 3). This so-called 'spacer effect' has proven very useful in the reconstruction of bone defects, where the resulting cylinder forms a stable receptacle for bone graft and also serve as a framework through which a bone segment may be transported. A variety of fixation options is currently available, although external fixation is generally preferred. Intramedullary PMMA nails do provide some stability, but cannot achieve the level of stability provided by external fixation. 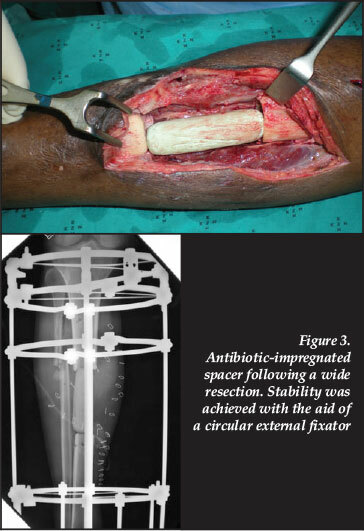 Curtis and colleagues found, in an experimental model, that infected osteotomies stabilised with external fixation had fewer and less severe infections than those stabilised with either a reamed or unreamed intra-medullary nail.41 Circular external fixators have gained much popularity in the field of post-infective reconstruction as a result of their modularity, minimally invasive nature and ability to effect bone transport and deformity correction. Many questions regarding the management of chronic osteomyelitis remain unanswered. The wide variety of treatment options currently available, combined with the advances in our surgical reconstruction abilities, makes disease classification and accurate host stratification now more important than ever. A dilemma commonly encountered is whether to embark on a palliative or curative treatment pathway. Although existing classification systems do offer some guidelines, the lack of objective selection criteria makes the decision a subjective one. The critical significance of correct patient selection is epitomised by the fact that failure of a curative (limb reconstruction) strategy invariably results in amputation of the involved limb. Surgical debridement offers definite advantages in terms of achieving eradication of infection. However, not all cases require surgical intervention in order to achieve quiescence and certain patients may be successfully treated with antibiotics alone. In the second part of this series on the management of chronic osteomyelitis, the principles of antibiotic therapy, as well as the current concepts in postdebridement reconstruction, will be explored.